Bill Meehleis (our founder) awarded the 2016 James L. Murdoch Lifetime Achievement Award! 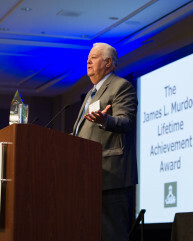 The James L. Murdoch Lifetime Achievement Award honors the memory and legacy of the late Jim Murdoch, who had an unrivaled commitment to education, and in particular, school facilities. Every year at the Annual Conference, C.A.S.H. recognizes one of its own with the James L. Murdoch Lifetime Achievement Award – One who has dedicated, and continues to dedicate, their professional life to carrying on Jim’s legacy. Congratulations Bill! We are proud of your nearly 50 years of modular school construction and the countless innovations you’ve brought this industry.